These fudgy, intensely chocolate brownies are perfect for vegans or people with egg/milk allergies. And best of all, the recipe calls for every day ingredients found in most kitchens. You don’t need any egg replacers, soymilk, soy cream cheese, hemp, …… just basic items. Since they’re so fudgy, it’s best not to cut them right away. Let them cool completely and if you have time, chill them. Measure out 1/2 cup of the flour and place it in a saucepan with the water (1 cup). Whisk flour and water together over medium heat until mixture becomes thick and gluey. Set it aside to cool. In a mixing bowl, thoroughly stir together both sugars, salt, cocoa powder and baking powder. Add oil and vanilla and stir until well mixed. 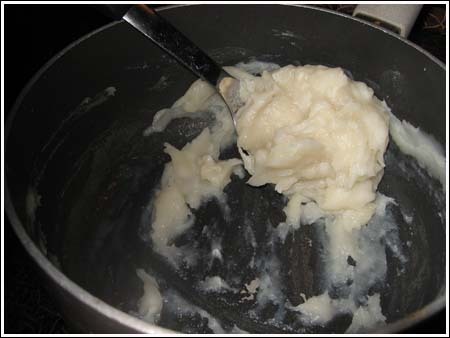 Add gluey flour mixture and stir until incorporated, then stir in remaining 1 ½ cups of flour. If using, add nuts and chocolate chips. Spread mixture in the pan and bake for 25 to 35 minutes or until brownies appear set. Let cool completely and chill. Lift from pan and cut into squares. Sorry it didn’t work for you. Wish I could figure out the variables that gave you such bad results — there are always crazy variables. This is one of my older recipes and having made it several times, I think I’ll add a note that says to refrigerate. It’s not critical, but it really helps develop the texture. I tried this- exactly following the recipe, I cooked for 30 minutes as it was not done at 25 minutes, although it turns out it wasn’t done at 30 minutes either! 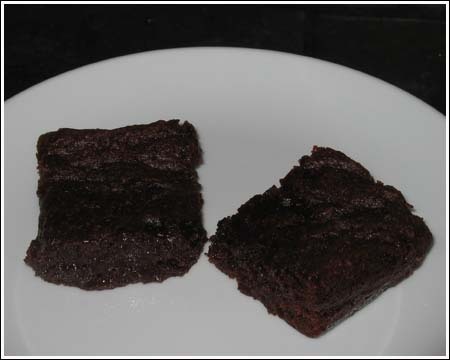 I tried the cooked corner of the brownie, but it was so bad, I had to rinse out my mouth!!! I thought that paste might be a great egg replacer, but I am staying well clear from now on! On a completely separate note, I love the best ever yellow cupcake recipe featured on your blog- it really is the best! i just made half of this recipe as an experiment and half of it was gone within 10 mins outta the oven!! i added chopped dark chocolate and underbaked it ever so slightly, the result was Heaven.ly. it was warm and so rich and gooey, with melted chocolate in every bite. i threw some of it in the freezer, took a bite after 1 hour, and i was in chocolate heaven again. thank you so much for this awesome awesome recipe. you made a recently-turned vegan with a huge sweet tooth very very happy today. Marie, that would be my guess. I think it just helps give the brownies extra bulk. Purely out of curiosity – what’s the purpose of the paste? To fully hydrate the flour with the water? It’s very intriguing. Do you know if I used whole wheat flour, how much I would use? Hi Bethany! Thanks for the review. Did you make any changes or substitutions? Mine are never that incredibly rich. Their brownie-like and satisfying, but not gooey. Sounds like something went wrong. Feel free to email me if you want to troubleshoot :). these are ridiculously rich! i had to bake them for a lot longer than 25 minutes, and they were still all gooey in the center. Yes, natural is the non-Dutched. However, I think Dutch chocolate will work just as well in terms of leavening because the recipe uses baking powder and brown sugar, which both add enough acid to the recipe to counteract the non-acidity of the Dutch process cocoa. Let me know how it goes with Dutched. If it works, I’ll take out the “natural” in Italics.